The Christmas countdown has begun! 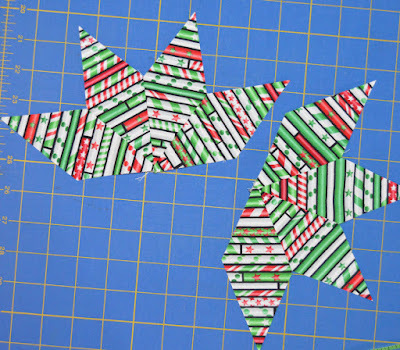 This is the last of five holiday-themed tutorials this week to add to that festive feeling. Are you ready to make some ornaments? Both of these stars are quick and fun, not to mention addicting! 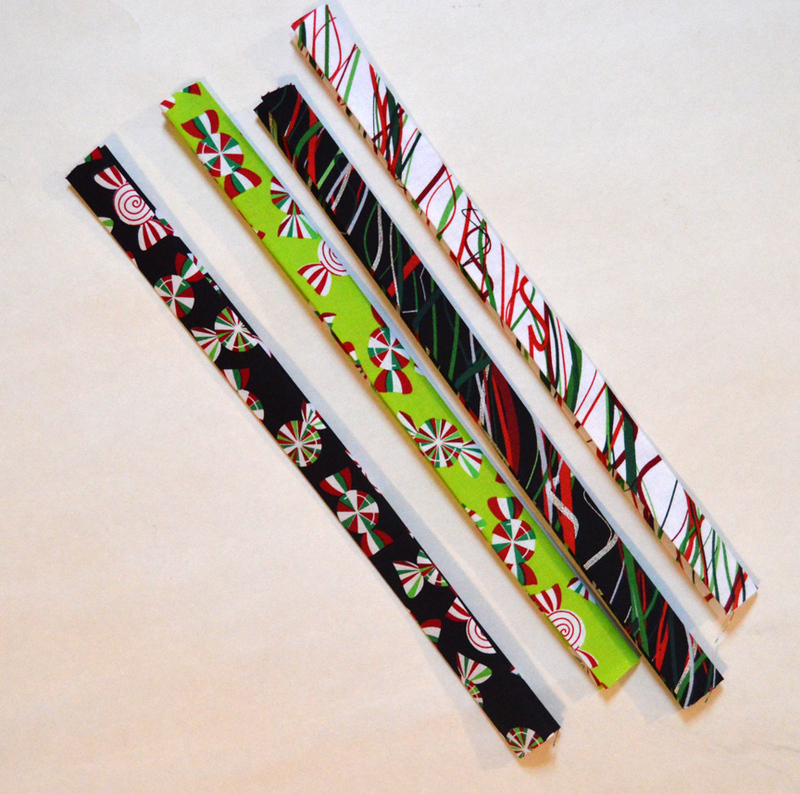 The fun stripes and bold designs of Maria Kalinowski's Holiday Cheer collection are perfect for these ornaments. 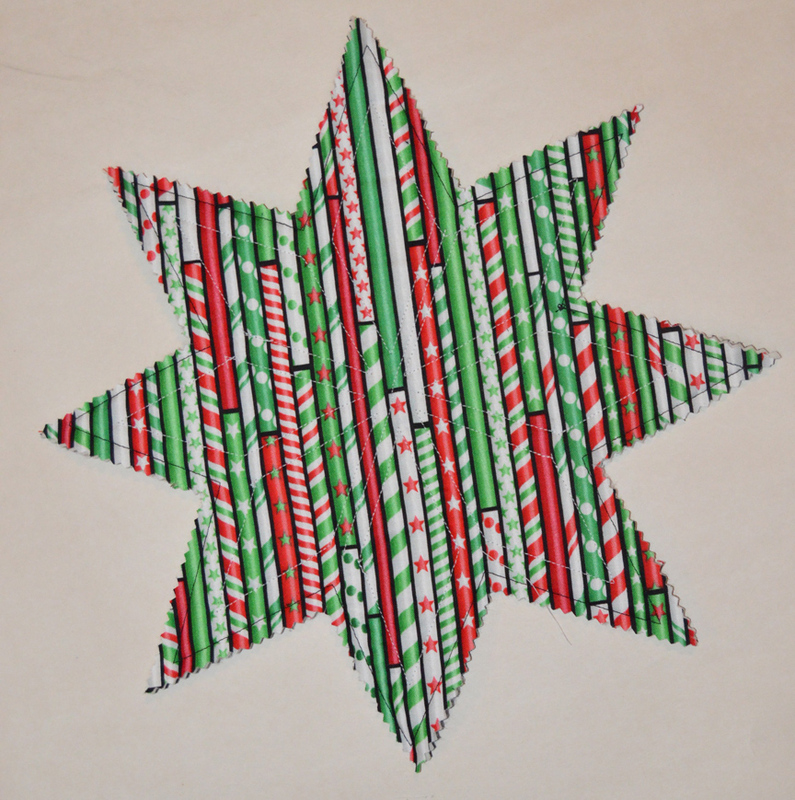 We used the four prints on the right for the folded star ornament, and the stripe on the left for our jumbo star ornament. 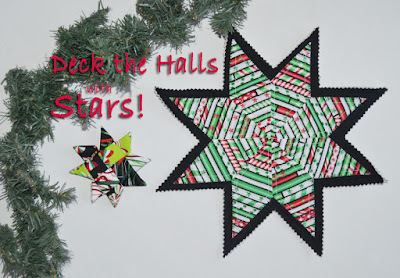 You can find the tutorial for the folded star ornament on Betz White's Crafting a Rainbow blog. We'll get you started, though! 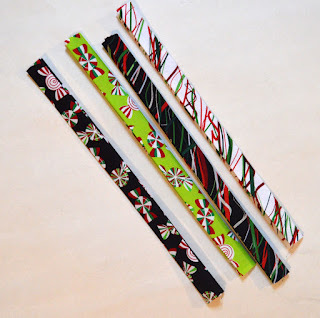 Cut four 3-1/4" x 12" strips and fold them in half lengthwise, right sides together. Unfold, and then fold the long raw edges in again to create a strip that is like a double-fold binding. Then head to Betz's blog to see how to fold! These stars are so cute! 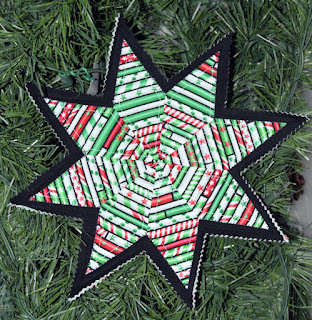 To make the jumbo star ornament, you'll need 1/2 yard of the stripe (includes backing) and one 12" square each of black solid and batting. Download and print our diamond template here. Cut it out. 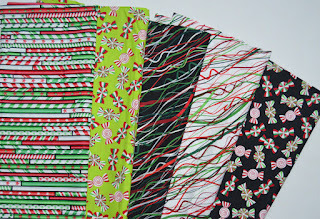 Cut two 3" x 42" strips with the stripe running the short way and one 12" square for backing. Sew the diamonds together into pairs, pressing the seams open. 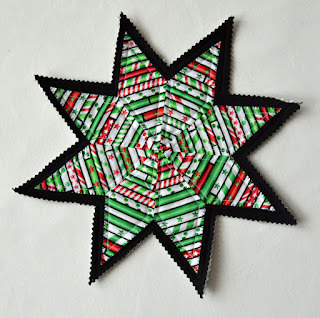 Sew the pairs together to create two half stars. Join the half stars to make a whole star. Press well. Layer the 12" backing square right side down and secure the batting and 12" black solid square on top using basting spray. Center the star on top and temporarily secure with basting spray. Use a blanket or other decorative stitch to secure the star to the quilt sandwich. Stitch 1/4" past the outer star edges using black thread. Stitch 1/4" inside each diamond shape using white thread. 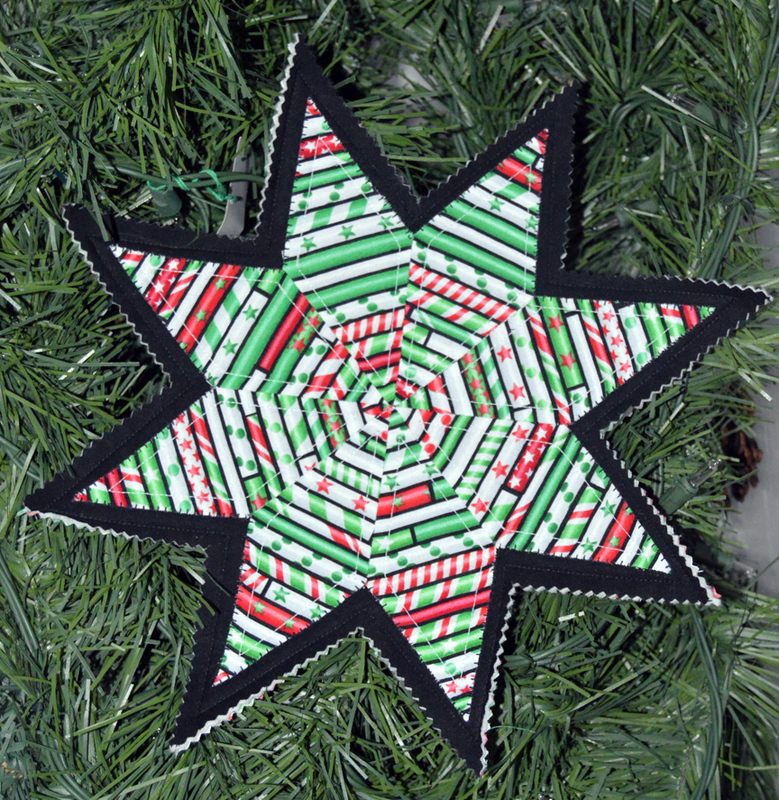 Use a pinking shears or pinked rotary cutter to cut out the star shape 1/4" beyond the black stitched line. Hand sew a loop for hanging. For a chance to win a bundle of one of our holiday collections, leave a comment below letting us know that you follow us on at least one of our social media platforms (either right here on the blog--options in the right hand sidebar, Facebook, Instagram, Pinterest), as well as telling us if you have any handmade ornaments on your tree. We'll randomly pick a winner and announce it next week! Giveaway is open through Monday, December 12th at 11:59 pm EST. I love the look of the star with the stripes cut like that. 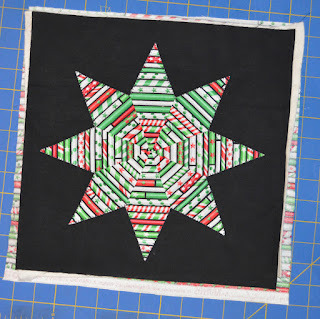 I love the strip fabric the star was made with! It is so fun looking! Lots of handmade ornaments on our tree, made by me, my daughters, and friends. 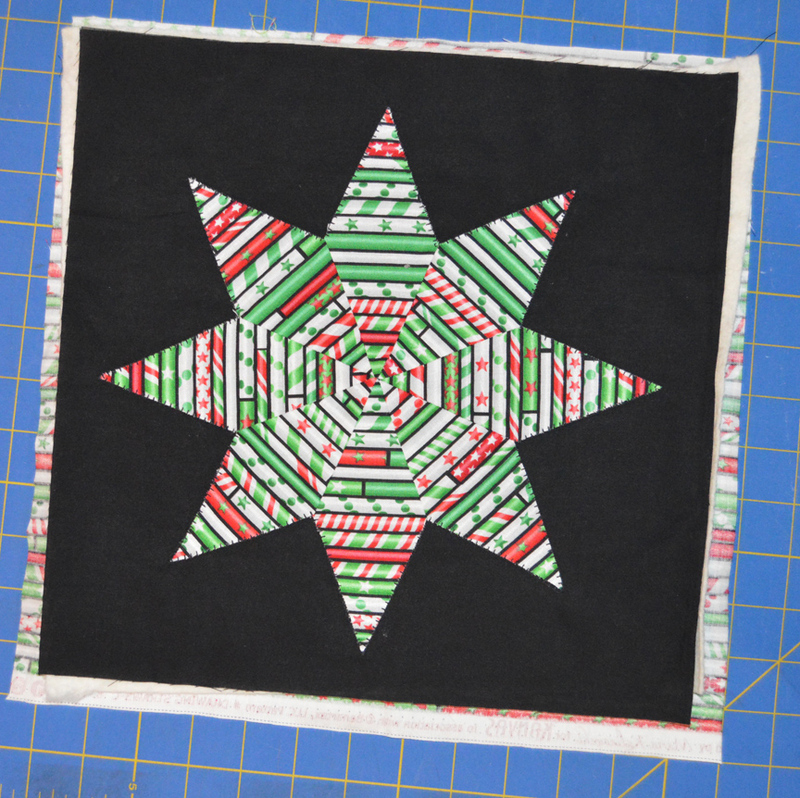 The Drawing Straws fabric you've used to make the large star is really awesome looking. It looks just like you made it from straws. VERY cool. I am a follower on Bloglovin' and via email notification as well as being a follower on Facebook. I actually have many handmade ornaments from the time my boys were in kindergarten through maybe 4th or 5th grade. There are also some I made from my different crafting/sewing periods throughout the years. In the past 3 yrs however, I have not put any of them on my tree. My husband bought me a gorgeous purple Christmas tree as a surprise so I bought white lights and purple ornaments, silver ornaments to put on it. I limited any other ornaments put on the tree as those from special times like my wedding ornament or my boy's 1st Christmas ornaments. I like/follow on FB! I have a few clear glass ball ornaments that I have filled with pretty things. I guess that counts as handmade. Lol. Thanks for the chance to win! I follow on Facebook and have some handmade special Christmas ornaments from my grandmother. FOLLOW on blog lovin',FB,gmail!Yes we have several handmade ornaments, some mine,some gifts, so pretty! THANK YOU FOR A NEAT GIVEAWAY! MERRY CHRISTMAS! I follow the blog via email. I have a lot of beaded ornaments my mom made that I put on the tree. I have a few cross-stitched ornaments that I made that I add to it as well. Follow via email. I have made by myself, my sister and a few internet friends ornaments on our tree. I follow on email. what adorable ornaments. thanks for sharing. I follow the blog by email notices. For many years my tree was decorated with only hand-made ornaments (except for the lights). I'll have to make one of the folded stars. It looks like it could be a fun mug rug. I am a Bloglovin' follower and yes, we have several hand-made ornaments on our tree. Most of them that the kids have made over the years and are very precious! I think I have one hand made ornament I brought back from Hawaii, and I remember purchasing one made by the Hmong crafters in Los Gatos. Star is great with the striped fabric. I follow by email. My tree is almost 100% handmade decorations. I have handmade ornaments on my tree. I follow you through e-mail, Facebook, Instagram and Pinterest. Thank you for the inspiration. I love the Star with the strips. Thank you for the giveaway. I am a follower through GFC and Bloglovin. I have many handmade ornaments on my tree. A lot of them are from my grandchildren. I follow the blog by email. I do have some homemade fabric ornaments but I no longer put up a tree. I need to find an alternative place to display some of my favorite ornaments. Love the prints in this collection. 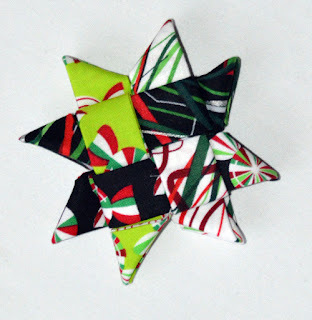 I just recently saw the folded ornament mentioned on another blog and really want to try to make some as gifts. I don't put up a tree any more. So sad aren't I? I like you on facebook and receive your emails. I just put my tree up and I have lots of handmade ornaments. Plus I made 60 for friends. I follow on BL and E-mail. I make hand made ornaments every year for our tree. I also make them for others and always give some to my grown children. Love, love, l.o.v.e these ornaments and especially the fabric. 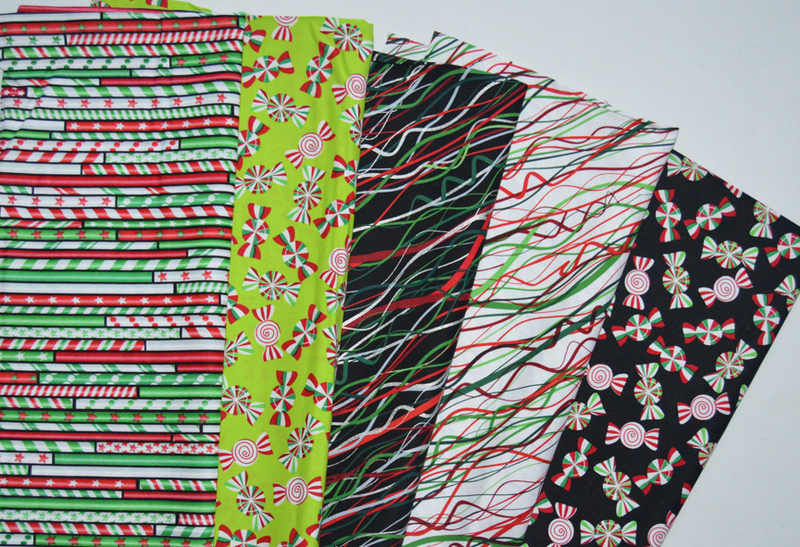 Thank you for the opportunity to win a bundle of fabric. I follow here the the blog. I follow the blog with email and also FB. We have lots of homemade ornaments. I follow by bloglovin, facebook, pinterest, and email. When I had a tree, I had many handmade ornaments. Still have them. I follow your blog with GFC, and follow you on FB and IG too. I don't have any handmade ornaments in my Christmas tree because it!s only about 20" tall. I follow you on FB. We have many, many handmade ornaments on our tree--some from when I was a little girl. And that was quite a while ago! I follow you with bloglovin. Almost all of the ornaments on our tree were made by me. I usually make a few more each year. I like you on FB and by email and yes I have handmade ornaments on our tree. I follow you on your blog. My tree has lots of hand made ornaments, including the folded star (this year's project). My tree has several hand made ornaments! I follow you on facebook and by email. Those are both so fun. I follow the blog. I follow you by email and on facebook. I have several crocheted snowflakes on my tree. I made them and love how they look. I follow your blog with blogger. We have a lot of homemade ornaments on our tree of all kinds. If I didn't have a tree I wouldn't have much in the way decorations for Christmas. I follow via Bloglovin. I have made many handmade ornaments in the past, that I still love to hang year after year! 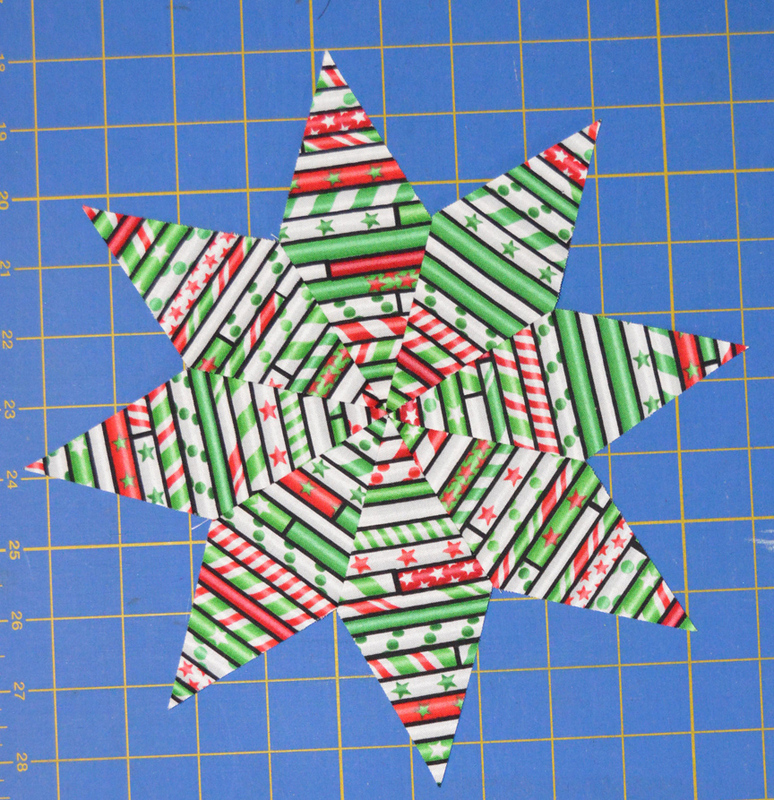 Thanks for the link for the folded star ornament...have been wanting to make one of those! Follow you on facebook: Nicole Sender. My tree has many handmade ornaments. My favorites are the beaded ornaments my mom made. I follow you via email notification. I don't put ornaments on my tree because I use a live Norfolk pine which is too delicate for ornaments. I usually just lay tiny red ribbon bows on the limbs. Any ornaments I make I give to my daughter for her tree. I follow your blog via email and also follow you on Facebook. Many, many handmade ornaments on my tree. Many years I make ornaments to give out to family members. I follow you on bloglovn! Thank you for the tutorial - I do have quite a few handmade ornaments on our tree! thanks! I follow the blog on my blogger dashboard/GFC. I have lots of handmade ornaments -- some made with or by my son when he was small, some that I have cross stitched or sewn, a very eclectic collection. Looove this Star! Thank you for Tutorisal! Very Creative!! Thank you for chance to win your Give-a-way!! yes I made some even last year. 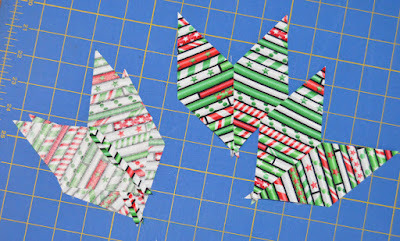 I've made some paper pieced gift tags that could be used as ornaments. I follow Sew in Love via Bloglovin. Thanks for the fun! I follow by email and I like you on Facebook, Instagram, and Pinterest. I do have a few homemade ornaments on my tree. Two years ago my daughter-in-law made a set of crocheted snowflake ornaments for me. I love the large star ornament. Great use of stripe! I follow via email, and Facebook and Instagram. Thanks. I follow by email and on Facebook. I haven't put up the tree yet, but there will be several handmade ornaments on it when it gets up next week. Following by email. I have counted cross stitch ornaments on my tree, but I need some quilty ornaments. I follow the blog through blog lovin and I "like" you on Facebook. No handmade ornaments on the tree this year. We only put up one and it is all metallic colors and crystal. No homemade ornaments here in that color! I make 2-1/2 - 3" fabric quilt block ornaments for our tree and for friends. I follow your blog by email & I also follow you on Facebook, Instagram & Pinterest! I do have several handmade ornaments for our tree: several stuffed kitties from a Jinny Beyer Christmas book, some cathedral window style ornaments, & some embroidered ornaments made with my embroidery machine. The kitties are my favorites--I made some from a red silk shirt my daughter used to wear. We still hang all the ornaments me and my late sister made for my parents from Elementary school! It would be fun to make some new ones this year. I follow your blog via email ksmith8@emich.edu, and your other social media sites. Thanks for the chance to win! I follow on Bloglovin. Unfortunately, I don't have any hand made ornaments on the tree this year, but I have a lot of hand made wall hangings this year. Thanks! I follow on Facebook and by email. I have lots of handmade ornaments, mostly ones by boys made in school. I follow on FB and by email. 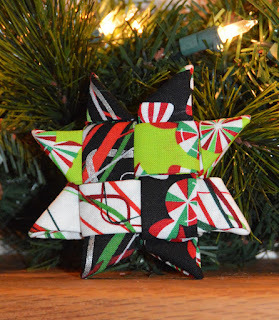 Love the folded star ornament! 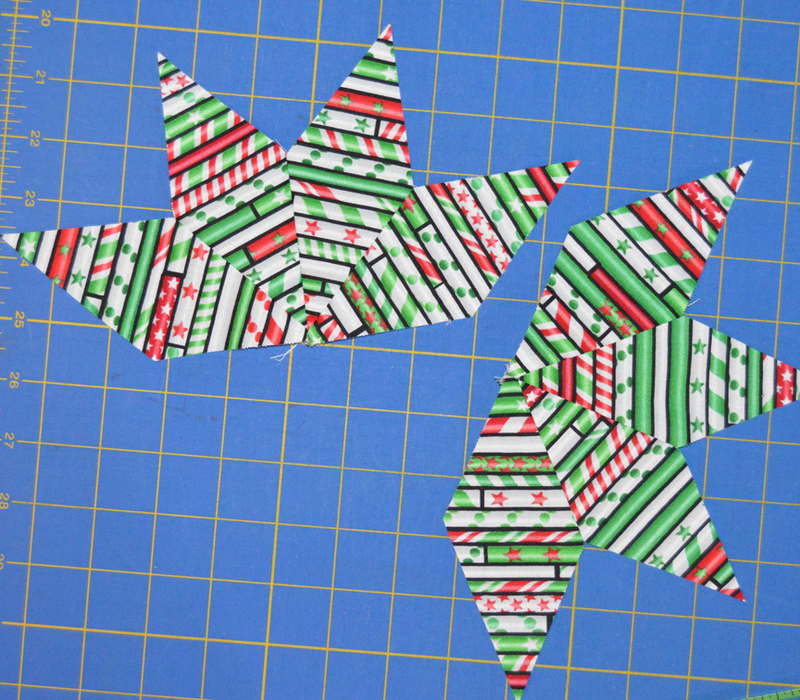 I follow you on Bloglovin--I have made a folded oragami type Christmas ornament. I follow on ig. I have a few felt ornaments but I never have time to make things for myself at Christmas by time I've finished gifts! I follow via email. I have around two dozen handmade ornaments that were made by myself, my sisters and my mom. They are over 30 years old. Yes I have many felt handmade ornaments and for the first time , this year, a quilted tree ornament. 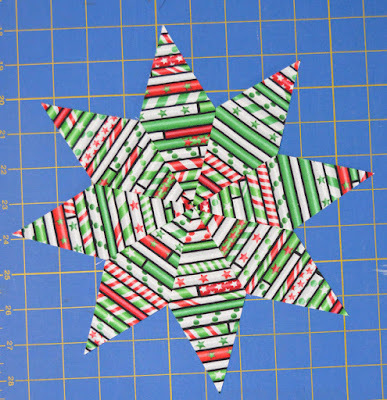 Thank you for sharing the Star tutorials...so awesome. I follow your blog via blog reader. 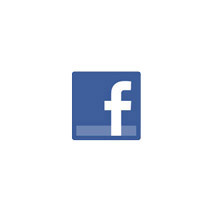 I like you on FB! I have handmade ornaments from my Grandmother, my Mother, my kids, and ones I made myself. They make Christmas traditions more personal. I follow you via bloglovin. My daughter caught this tutorial also and emailed me about it.